Miportfolio is a Unique Responsive One-Page Creative Theme, featuring some Cutting-Edge Menu Styles. It is the Perfect Theme for Designers, Developers, Writers, Photographers, Agencies, Musicians or any other Creative Professionals. 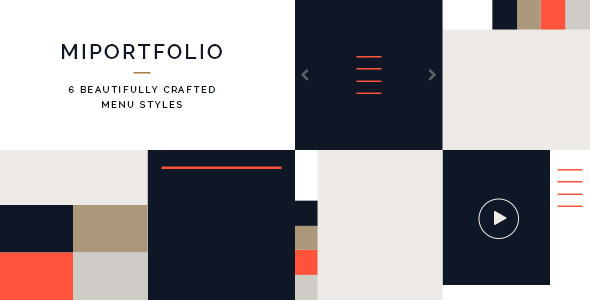 Miportfolio comes with Six Beautifully Crafted Demos and Unique Menu Styles. It includes a Carousel Slider, Flex Slider, Vimeo Video, HTML Background Video, Draggable Fullscreen Background Slider and 3D Image Gallery. All these features will help you create your very own Unique Portfolio. Miportfolio is Empowered by the Latest Advancements in HTML5 & CSS3 Animations to provide you with first class User Experience. It also comes with a Working Ajax Contact Form. This entry was posted in creative, site-templates and tagged agency, ajax contact form, business, creative, cv, freelancer, modern, multipurpose, personal, photography, portfolio, resume, studio, unique by Acty. Bookmark the permalink.